Spacedex is now on Instagram. Follow us for infographics and more! How can I best view the Perseids meteor shower? If you live near a brightly lit city, drive away from the glow of city lights and toward the constellation from which the meteors will appear to radiate. 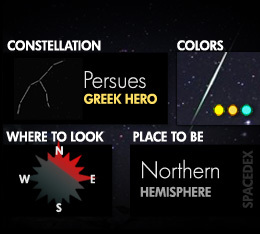 For example, drive north to view the Perseids. Driving south may lead you to darker skies, but the glow will dominate the northern horizon, where Gemini rises. Perseid meteors will appear to "rain" into the atmosphere from the constellation Gemini, which rises in the northeast around 11 p.m. in mid-August. If you can see each star of the Little Dipper, your eyes have "dark adapted," and your chosen site is probably dark enough. Under these conditions, you will see plenty of meteors. Circle August 12th on your calendar, for early that morning a moderate to possibly very strong showing of annual Perseid meteor shower is likely. The very strong display will favor those living across much of the Northern Hemisphere. In this region, meteor rates might briefly rise to a few hundred per hour (the time frame for the most intense activity is anticipated sometime around 21:40 GMT). Waxing Gibbous. Perseids shower gazing conditions will not be ideal. The moon will obstruct all but the brightest Perseids. Name origin: Appears to radiate from the constellation Perseus. History of Perseids coming soon! The Perseids have been observed by humans for about 2000 years, with the earliest knowledge of their existence emerging from the Far East. It is one of the finest meteor showers to observe, producing up to 60-200 bright, fast, and colorful meteors per hour during their peak. This annual meteor shower is active from July 17th through August 24th, and usually peaks on August 12th and 13th. Perseids is extremely consistent in its timing and can potentially be observable for several weeks in the summer sky, conditional on your whereabouts, lighting conditions, and weather. Meteor showers are commonly named after their radiant point, the perspective point in the sky from which the meteors appear to come from. In the case of Perseids, it is named after the constellation Perseus, which is positioned in approximately the same point in which the Perseids meteor shower appears to originate from. While this summer spectacular appears to radiate from a constellation, they are actually caused by the Earth passing through the dust particles of the comet Swift-Tuttle. Each summer, Earth passes into a trail of dust left by this comet, and as a result, all the dust and debris burning up in our atmosphere, travelling at a very fast 132,000 miles per hour (59 km/s), produces the spectacle known as the Perseids meteor shower, or what are popularly recognized as “shooting stars”. There's no danger to sky watchers, though. The fragile grains disintegrate long before they reach the ground. While the meteors are certainly bright, they are typically not much larger than a grain of sand. However, as they travel at immense speeds, these tiny particles put on an impressive show. Due to the way the comet’s orbit is tilted, dust from the Swift-Tuttle falls on Earth’s northern hemisphere. Unfortunately, this leads to extremely low visibility for those in Australia, New Zealand, and portions of South America. In 2016, The Waxing Gibbous Moon on August 13th and the Full Moon occurring after the shower, on August 18th, will have a negative impact on the visibility of the Perseids. Due to the bright moonlight, the fainter meteors may not be visible. 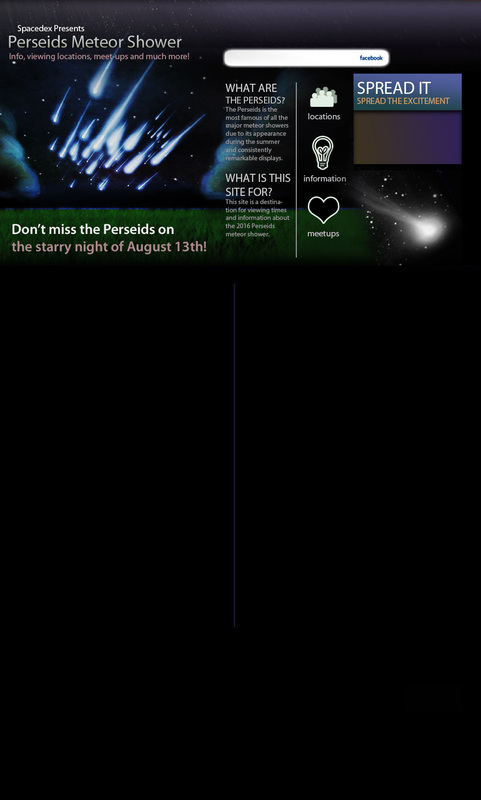 It is advisable to observe the meteor shower during the predawn hours on the mornings of August 11, 12, and the 13th. With up to 60-200 meteors per hour predicted, observers may catch several bright meteors streaking along in the night sky. If you happen to live near a brightly lit city, if possible, we recommend that you drive away from the glow of city light. After you’ve escaped the glow of the city, find a dark, safe, and possibly isolated spot where oncoming vehicle headlights will not occasionally ruin your sensitive night vision. Look for state or city parks or other safe dark-sites. Once you have settled down at your observation spot, look approximately half way up the sky facing northeast. This way you can have the Perseids’ radiant within your field of view. Looking directly up at the sky or into the radiant is not recommended since this is just the point in which they appear to come from. You are more likely to see a trail when looking slightly away from this point. Looking half-way up into the sky will lead to the best show in the house! Waxing Gibbous Moon. Perseids shower gazing conditions will not be favorable. Moon may obstruct the faintest Perseids meteors.